It was very remarkable then to see us all turning up suddenly in a Conference Hall – and a conference is a different thing. If you think, before, physically, we’d always been around the pub table, or we’d been sitting on the floor in each other’s houses or scattered about. Then suddenly, here we were at a conference with organised speakers, and it was a great fun event. But it was a step up. You lost the, sort of, personal closeness of talking one to one with somebody or other, just sitting instead, you know, in an audience and being addressed by speakers. But it was an ambitious step, moving in such a short time. It was only a matter of years from having a meeting in an upstairs room – a biblical upstairs room – in a pub to somehow, going to the Institute of Education and having a real Conference. And it was such an unlikely place for us because we, after all, in one sense, a rather formal educational environment but actually, we warmed it up nicely in the end. It was a very good place to be. What did it say about you, as an organisation? Well, you know, that we existed. That we counted. That we were also a real level of seriousness. That, it was interesting, we didn’t think to have a Women in Publishing Conference and then be addressed by the male chairman of the Publishers’ Association. 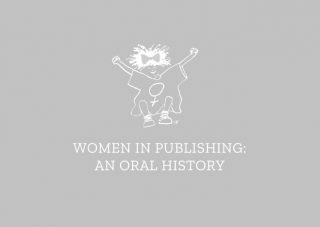 There was no question that we needed to invite men who were working in publishing ‘cos in fact, despite the fact that there were so few women who had broken through the glass ceiling, there was still plenty to talk about.